Learn about the new and changed features of Oracle Oracle API Platform Cloud Service . A new tab, Security Settings, was added to the Platform Settings page in Release 19.2.1. This new tab allows you to view the Client ID, Client Secret, and scope for your instance. See View Security Settings. On list pages for APIs, plans, applications, services, service accounts, and gateways, you can now enclose a search term in quotes to find an exact match. See Understand the APIs List Page for an example. A button has been added to display a list of applications for selection. See Apply Application-Based Routing Policies. A button has been added to display a list of gateways for selection. See Apply Gateway-Based Routing Policies. 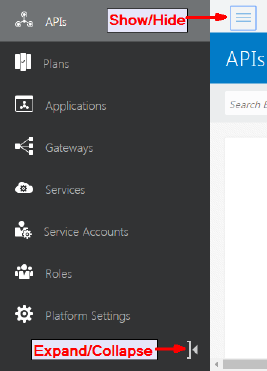 The pages in the interface that list the APIs, plans, applications, services, and service accounts have been redesigned to make it easier to view information. When applying the resource-based routing policy, you can now route requests based on actions and methods as well as resources from an Apiary specification. If you are configuring it manually, you can also now route requests on methods and method+path combinations in addition to paths. See Apply Resource-Based Routing Policies. If the installed version of your gateway is 18.4.3 or later, there is no need to re-install the gateway for 19.1.3. This new policy allows you to enable an end-user identity to be passed over multiple hops before reaching the destination web service. See Apply Outbound WSS Username Token Policies. This new policy allows you to enforce verification of credentials sent within the SOAP payload and allow only authorized users to access APIs. See Apply Inbound WSS Username Token Policy. There were no new features in release 18.4.5. This release contained internal infrastructure updates and bug fixes. 28943090 - APIs and Plans pages time out in Deveoper Portal The query was optimized to reduce the number of IDCS calls and make the query faster. 28957876 - remove "links" as fields in API list page When rendering the API list page, REST calls to /plans and /apis are made. In both cases, the field "links" was included, explicitly for /apis and implicitly for /plans. The REST call to /plans was updated to pass ?fields=id to ensure the links are not looked into, and REST call to /apis was updated to remove "links" as a field to return. 28642385 - Some analytics data did not allow the time to display in the local time zone Charts and tables in Analytics will now display in the local time zone, not the platform time zone. 28881998 - Republish button in Plan tab is extra Plans have no iterations, so any change to the plan is immediately visible in the Developer Portal. The Republish button is uneccessary and is removed. 28925217 - Remove roles from grants pages and dialogs The queries for grants took a long time to execute due to the role parts of the queries. The query parameters for roles and the Role columns were removed from the UI. 28963833 - Show/Hide navigation menu doesn't open in Internet Explorer 11 The navigation menu now opens in Internet Explorer 11. 28883652 - Redesign the Requests by Resource grid to scroll the data virtually Queries on the Gateway analytics page were very slow, or hung up. To resolved this, auto refresh was removed and there is now a Refresh button. Also, the grids have been redesigned to "virtually scroll" the data. 28948363 - Application-based routing not working as expected after release 18.4.3 The application selection drop-down list now shows all available applications. You add rate limits on entitlements to control requests from a specific API to a plan. If an API uses an Apiary specification, you can now set rate limits for specific actions in the API. See Setting a Rate Limit for an Entitlement. If an API uses an Apiary specification, you now have the option of configuring the resources using actions from the API specification or configuring them manually in the Interface Filtering and Method Mapping policies. See Applying Interface Filtering Policies and Applying Method Mapping Policies. You can now filter analytics results by plans, services, and methods. See Filtering Analytics. There is a new element called ScopeClaimDataType, which allows you to specify whether the scope values in JWT are space-separated or in JSON structure. See The OAuth Profile XML File. You can now add custom pages to the Developer Portal. See Managing Custom Pages. A new navigation menu sidebar on the left of the window was introduced in 18.4.1. It contains options to access the pages for APIs, Plans, Applications, Gateways, Services, Service Accounts, Roles and Platform Settings. When it is expanded, both icons and text appear; when it is collapsed, only the icons appear. It can also be hidden completely, and then viewed again using the Show/Hide Navigation Menu option above the blue banner. In 18.3.5, if your API was created with an Apiary specification, you can choose to use actions from the specification in the Interface Filtering and Method Mapping policies. See Applying Interface Filtering Policies and Applying Method Mapping Policies. There were no new features in release 18.3.3. This release contained internal infrastructure updates only. The filters on the analytics pages were redesigned. All the filters, including the time filters, are now in a sidebar. When you link an Apiary specification, the API actions are listed on the Specification page. You can expand each action to view its details. On the Plans Subscription page, you can now view application details. There is a new grant for Gateways, called Entitle Gateway in Plan. This allows a user to entitle the gateway in a plan. See Issuing Gateway Grants. You can now view plans and their details in the Developer Portal. See Discovering and Entitling Plans. Documentation for Oracle API Platform Cloud Service that describes new and changed features.